Dating of the Viking Age Landnám Tephra Sequence in Lake Mývatn Sediment, North Iceland Magnús Á. Sigurgeirsson1, Ulf Hauptfleisch2, *, Anthony Newton3, and Árni Einarsson2 Abstract - Soil profiles and archaeological sites in Northeast Iceland contain a sequence of basaltic tephra layers coinciding in time with the first human settlement of the area during the Viking Age, known as the Landnám tephra sequence. The chronology of these layers is useful when reconstructing the history of human settlement in Iceland and its environmental impact. The only properly dated tephra layer from this tephra sequence is the Landnám tephra layer (LTL), formed in the A.D. 870s. Sedimentation rates calculated from the interval between tephra layers of known age (A.D. 871 ± 2, 1158, and 1300) in high-resolution sediment cores from Lake Mývatn were used to establish the approximate age of six tephra layers in the medieval period. One of the main objectives of the study was to improve dating of a younger tephra layer, formed in the mid-10th century according to previous studies. This tephra layer, originating from the Veiðivötn volcanic system, has proven to be a very important marker bed for archaeological research in the Mývatn area. The results indicate that the 10thcentury Veiðivötn tephra formed in the period A.D. 930–940. The paper proposes the name V-Sv for this tephra layer. Tephrochronology established from lacustrine sediment cores with high sedimentation rates can provide valuable additional information for constructing chronologies at archaeological sites in the North Atlantic. 1Iceland Geosurvey (ISOR), Grensásvegi 9, IS-108 Reykjavík, Iceland. 2Mývatn Research Station, Skútustaðir, IS-660 Mývatn, Iceland and University of Iceland, Reykjavík, Iceland. 3University of Edinburgh, Institute of Geography, School of GeoSciences, University of Edinburgh, Drummond Street, Edinburgh EH8 9XP, Scotland, UK. *Corresponding author - ulh2@hi.is. 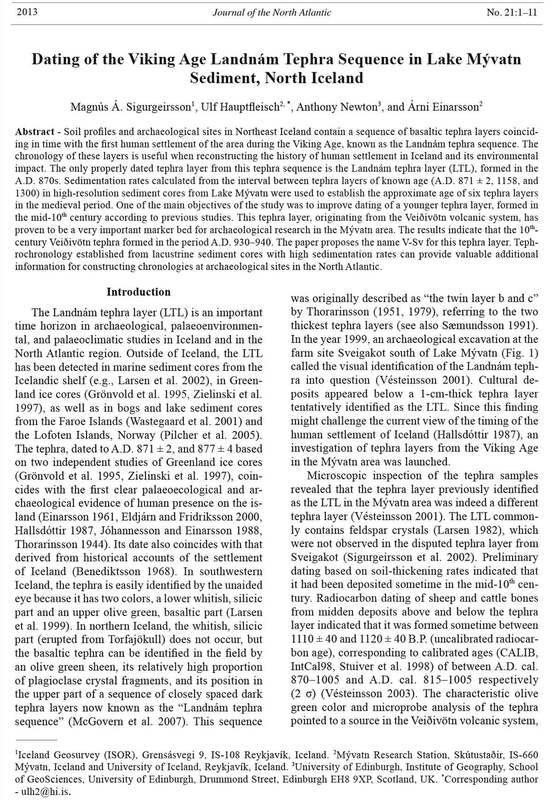 Introduction The Landnám tephra layer (LTL) is an important time horizon in archaeological, palaeoenvironmental, and palaeoclimatic studies in Iceland and in the North Atlantic region. Outside of Iceland, the LTL has been detected in marine sediment cores from the Icelandic shelf (e.g., Larsen et al. 2002), in Greenland ice cores (Grönvold et al. 1995, Zielinski et al. 1997), as well as in bogs and lake sediment cores from the Faroe Islands (Wastegaard et al. 2001) and the Lofoten Islands, Norway (Pilcher et al. 2005). The tephra, dated to A.D. 871 ± 2, and 877 ± 4 based on two independent studies of Greenland ice cores (Grönvold et al. 1995, Zielinski et al. 1997), coincides with the first clear palaeoecological and archaeological evidence of human presence on the island (Einarsson 1961, Eldjárn and Fridriksson 2000, Hallsdóttir 1987, Jóhannesson and Einarsson 1988, Thorarinsson 1944). Its date also coincides with that derived from historical accounts of the settlement of Iceland (Benediktsson 1968). In southwestern Iceland, the tephra is easily identified by the unaided eye because it has two colors, a lower whitish, silicic part and an upper olive green, basaltic part (Larsen et al. 1999). In northern Iceland, the whitish, silicic part (erupted from Torfajökull) does not occur, but the basaltic tephra can be identified in the field by an olive green sheen, its relatively high proportion of plagioclase crystal fragments, and its position in the upper part of a sequence of closely spaced dark tephra layers now known as the “Landnám tephra sequence” (McGovern et al. 2007). This sequence was originally described as “the twin layer b and c” by Thorarinsson (1951, 1979), referring to the two thickest tephra layers (see also Sæmundsson 1991). In the year 1999, an archaeological excavation at the farm site Sveigakot south of Lake Mývatn (Fig. 1) called the visual identification of the Landnám tephra into question (Vésteinsson 2001). Cultural deposits appeared below a 1-cm-thick tephra layer tentatively identified as the LTL. Since this finding might challenge the current view of the timing of the human settlement of Iceland (Hallsdóttir 1987), an investigation of tephra layers from the Viking Age in the Mývatn area was launched. Microscopic inspection of the tephra samples revealed that the tephra layer previously identified as the LTL in the Mývatn area was indeed a different tephra layer (Vésteinsson 2001). The LTL commonly contains feldspar crystals (Larsen 1982), which were not observed in the disputed tephra layer from Sveigakot (Sigurgeirsson et al. 2002). Preliminary dating based on soil-thickening rates indicated that it had been deposited sometime in the mid-10th century. Radiocarbon dating of sheep and cattle bones from midden deposits above and below the tephra layer indicated that it was formed sometime between 1110 ± 40 and 1120 ± 40 B.P. (uncalibrated radiocarbon age), corresponding to calibrated ages (CALIB, IntCal98, Stuiver et al. 1998) of between A.D. cal. 870–1005 and A.D. cal. 815–1005 respectively (2 σ) (Vésteinsson 2003). The characteristic olive green color and microprobe analysis of the tephra pointed to a source in the Veiðivötn volcanic system, 2013 Journal of the North Atlantic No. 21:1–11 2 Journal of the North Atlantic No. 21 located some 100 km south of Mývatn. Based on present knowledge, this tephra layer has hitherto been referred to as the 10th-century Veiðivötn tephra or preliminarily as the A.D. V~950 (Sigurgeirsson 2001, Sigurgeirsson et al. 2002). An isopach map is not available at present, but preliminary studies indicate that its axis of maximum thickness crosses the Mývatn region (M. Sigurgeirsson, ISOR, Reykjavík, Iceland, 2002 unpubl. data). In soil sections, a second thin greenish tephra layer is found a few cm below the 10th-century Veiðivötn tephra (Fig 2). This layer does contain distinctive feldspar crystals and can be identified as the LTL. This relatively thin layer is in agreement with the 0.5-cm thickness found on the distribution map of Larsen (1984) of the LTL. At present, the best available dating of the 10thcentury Veiðivötn tephra is an age estimate based on thickening rates of aeolian soils in the Mývatn area (Sigurgeirsson 2001, Sigurgeirsson et al. 2002), which must be considered rather inaccurate due to low sedimentation rates during the time between the deposition of LTL and H-1104 tephra (Ólafsdóttir and Guðmundsson 2002, Sigurgeirsson 2001) or are influenced too much by environmental change (Lawson et al. 2007). Because of the importance of the 10th-century Veiðivötn tephra for dating the early settlements in the Mývatn area and northeastern Iceland in general, a more accurate date is desirable. This paper aims to improve the dating of the 10thcentury Veiðivötn tephra by using lake sediments in Lake Mývatn. Methods In 2006 and 2011, sediment cores were taken from Lake Mývatn, with the main objective to establish the 9th- to 11th-century tephrostratigraphy and get a more reliable age estimate for the 10th-century Veiðivötn tephra. Lake Mývatn was chosen for this study because previous research indicates that the sediment accumulation rate in this lake has been high and rather uniform in the A.D. 10th to 13th centuries, thus favoring the stratigraphic separation of tephra layers (Einarsson et al. 1993, 2004). Sediment was cored in a small, sheltered bay, Syðrivogar, on the east side (Fig. 1). The study site was carefully chosen to minimize problems associated with variable sedimentation rates. The bay of Syðrivogar is an exceptionally stable environment for a lacustrine site. It is small and sheltered by high banks composed of thick lava with a rough surface. There is no surface water runoff, and the organic sedimentation is wholly autochthonous, primarily by benthic diatoms growing in a steady flow of nutrient-rich and cold water. The basin is fed by cold (about 5.5 °C) spring water, with a stable flow and no surface water inflow. A pilot study (Á. Einarsson, 2005 unpubl. data) had shown that the bay comprised a separate sedimentary basin with high sedimentation rate and at least 3.5 m of light-colored diatomaceous gyttja interrupted Figure 1. A. Map of Iceland, showing the research area (black rectangle) and the position of marine core MD99-2275 (1) and soil profiles at Svartárkot (2), Jökuldalur (3), Sauðárhraukar (4), Kárahnjúkar (4), Snæfell (4), and Atley (5). B. Research area, showing the location of the coring sites in 2006 and 2011 (Syðrivogar), the soil sections at Sveigakot and Sellandafjall, and Helluvatnstjörn. 2013 M.Á. Sigurgeirsson, U. Hauptfleisch, A. Newton, and Á. Einarsson 3 and contrasted by dark distinctive basaltic tephra layers, including two Veiðivötn layers, V-1717 and V-1477, and one from Hekla, H-1300, as well as the Landnám tephra sequence (letters refer to source volcano, numbers refer to year of deposition). The tephra layers V-1717, V-1477, H-1300, and LTL were identified by their typical macroscopic characteristics: mainly color, thickness, and grain size. In 2006, a 1-m-long core (SV-1) was taken with a 7-cm-wide and 100-cm-long Russian corer (Jowsey 1966). The core was taken from aboard a boat at 2.1–3.1 m depth in the sediment, at a water depth of 2.8 m. A series of ten 1-m-long cores (SVA 1–10) was retrieved in 2011 from three more sites in the same bay (stratigraphical data in Table 1) to verify the stratigraphic sequence and the calculated sedimentation rates from core SV-1. The cores SVA- 5 and 6 were excluded from this study, because of non-perpendicular penetration of the sediment. All depths in the sediment are calculated from the top of the lake sediment surface. The sedimentation rate between two tephra layers of known age was calculated by measuring the accumulated sediment between the upper margin of the older tephra layer and the lower margin of the younger tephra layer. The thickness of tephra layers situated between the pair of measured tephra layers was subtracted from the accumulated sediment. One measurement of accumulated sediment was collected for every pair of tephra layers at a resolution of 0.5 mm. Calculated sedimentation rates built on the age of the LTL are based on two dates for the LTL. While the most commonly quoted date for the LTL is A.D. 871 ± 2 (Grönvold et al. 1995), a slightly younger date of A.D. 877 ± 4 was proposed by Zielinski et al. (1997). The light-colored diatomaceous gyttja has an admixture of tephra particles, including light-colored microscopic glass shards and pumice fragments that are scattered throughout the sediment. These particles have most likely been blown from silicic prehistoric Hekla tephra layers (i.e., Hekla 3 and Hekla 4) prominent in eroding soils of the surrounding heathlands. Several dark-colored tephra layers were visible to the unaided eye, most in the lower part of the core (Fig. 3). However, the expected light-colored tephras, including the two thin but important Hekla tephra layers H-1104 and H-1158, Figure 2. Soil sections with tephra layers from Sellandafjall and the archaeological site of Sveigakot (all sections based on Sigurgeirsson 2001). The capital letters and colors refer to the volcanic system as the source of the tephra, Veiðivötn (V, green), Hekla (H, red), Katla (K, violet), Grímsvötn (G, blue), Öræfajökull (Ö, orange), and Torfajökull (T, tan). The color code is based on Óladóttir et al. (2011a, b) and Gudmundsdóttir et al. (2012). Tephra layers of unknown volcanic origin are shown in black. 4 Journal of the North Atlantic No. 21 were not visible because of their resemblance to the diatomaceous gyttja. In an attempt to locate these well-dated and important layers, x-ray photographs were obtained of the SV-1 core. Since it was not possible to locate all the layers by this method, the upper half of the core was cut into 0.5-cm slices, and the lower half was sectioned into 1-cm thick slices, making for a total of 150 slices in all. Samples from the 0.5-cm slices were examined carefully with a stereomicroscope in order to locate any increases in the amount of silicic tephra in the sediment. The geochemistry of all sampled tephra layers from the 2006 core was established by microprobe analysis of the glass component. Glass shards were incorporated in resin on a frosted slide and ground to a thickness of approximately 75 μm and then polished with 6-μm and 1-μm diamond pastes. The slides were then carbon coated. All analyses were undertaken on a five-spectrometer Cameca SX100 electron microprobe at the School of GeoSciences at the University of Edinburgh and analyzed using the wavelength-dispersive method. An accelerating voltage of 10 kV and a beam current of 10 nA were used. In order to compensate for mobility of Na during the analysis, a beam diameter of 5 μm was used and a real-time decay curve correction Figure 3. X-ray photograph (a), photograph (b), and stratigraphic profile (c) of sediment core SV-1 from Lake Mývatn. The 10th-century Veiðivötn tephra may be seen at a depth of 271.5–272 cm below the lake sediment surface. Color code and capital letters are the same as in Figure 2. Tephra numbers are the same as in Table 1. Table 1. Stratigraphical position of tephra layers from Syðrivog ar, Lake Mývatn. All measurements in cm from lake sediment surface. Tephra layer No. Name SV-1 SVA-1 and 2 SVA-3 and 4 SVA-7 SVA-8 SVA-9 and 10 0a V-1477 159.0–162.4 156.0–157.0 0b H-1300 217.0–218.0 217.2–218.0 212.0–212.6 211.7–212.2 224.7–225.1 1 217.5–218.0 2a 232.5–233.0 2b V-1159 232.5–233.0 2c H-1158 232.5–233.0 3 V~950 271.5–272.0 319.5–320.5 313.5–314.5 327.2–327.9 4 V-871 (LTL) 283.5 337.5–338.0 330.6–331.0 304.0–305.0 344.0 5 295.0–295.5 350.0–351.0 343.5–344.5 358.0–358.9 6 299.3–299.5 356.8–357.0 362.8 7 300.5–301.0 359.0–359.3 365.8 8 308.0 395.0–395.3 396.8 2013 M.Á. Sigurgeirsson, U. Hauptfleisch, A. Newton, and Á. Einarsson 5 (Nielsen and Sigurdsson 1981) was carried out by the microprobe’s Peak Sight software. It should be pointed out that most of the tephra layers analyzed were of basaltic composition and therefore suffer little or no Na-mobility problems during a typical analysis. Standard basaltic glasses (TbIG [terbium iron garnet] and a Lipari obsidian fragment) were analyzed throughout the analytical session to check for instrument stability and correct for it. A total of 6 to 10 tephra grains per sample were analyzed. Results All tephra layers mentioned in this study had sharp and clear upper and lower boundaries to the gyttja. The Hekla tephra H-1300, previously detected in soils of the Mývatn area (Einarsson et al. 1988) and in the pilot study (Á. Einarsson, 2005 unpubl. data), was not found in core SV-1, indicating that its top predates A.D. 1300. As expected, still younger tephra layers (V-1477 and V-1717) prominent in the Mývatn sediment, and found in the pilot study, were also absent from core SV-1. Increases in the amounts of silicic tephra were detected by the microscopic examination of the SV-1 core at 232.5–233.0 cm and 242.5– 243.0 cm from the sediment surface. The analysis of the lighter-colored tephra from 232.5–233.0 cm (Tephra 2c) revealed a definitive chemical signature of Hekla-1158 (Fig. 4). The eruption date A.D. 1158 of this silicic tephra layer from Hekla was derived from the medieval Konungsannáll (King’s Chronicle [Storm 1888]) by Thorarinsson (1968) (see also Larsen 2002). Hjartarson (1989) found that the precise records of the medieval annals of comets and solar eclipses indicated their reliability. In total, eight basaltic tephra layers, dark gray and gray-greenish in color, were identified in core SV-1 (Fig. 3). All of them were easily visible to the unaided eye. The microprobe analyses indicate that the basaltic tephra layers in the core originated from three different volcanic systems: Veiðivötn, Grímsvötn, and Katla (Table 2, Fig. 5). The origin Figure 4. Silicic tephra layer from core SV-1 from Syðrivogar, plotted as raw data on a TiO2/FeO diagram. Previous analyses of the H-1104, H-1158, and H-1300 tephra are from Larsen et al. (1999) and Larsen (2002). Table 2. Glass chemistry (mean %) determined by electron microprobe analyses of tephra layers in the sediment core SV-1 from Syðrivogar, Lake Mývatn and from soil sections at Sellandafjall and the archaeological site of Sveigakot (data from Sellandafjall and Sveigakot from Sigurgeirsson ). n = number of tephra grains analysed. Origin = volcanic system. Tephra layer n SiO2 TiO2 Al2O3 FeO MnO MgO CaO Na2O K2O P2O5 Total Origin 1 6 49.63 1.85 13.55 11.71 0.21 6.93 11.45 2.27 0.22 0.23 98.05 Veiðivötn 2a 5 49.93 2.32 13.56 11.33 0.24 6.48 10.96 2.51 0.33 0.31 97.96 Grímsvötn 2b 4 49.74 1.73 13.15 11.35 0.26 7.20 11.83 2.18 0.18 0.22 97.82 Veiðivötn (V-1159) 2c 20 68.18 0.49 14.25 5.62 0.16 0.44 3.06 2.55 4.46 0.10 99.32 Hekla (H-1158) 3 10 49.63 1.84 13.5 11.37 0.18 6.93 11.46 2.41 0.22 0.24 97.78 Veiðivötn (V~950) 4 10 49.52 1.88 13.45 12.01 0.24 6.59 11.17 2.37 0.24 0.22 97.69 Veiðivötn (V-871) 5 8 49.73 3.54 12.52 14.12 0.26 4.78 8.76 2.91 0.58 0.42 97.62 Grímsvötn 6 10 49.29 2.10 13.98 10.67 0.20 7.18 11.86 2.45 0.28 0.25 98.26 Grímsvötn 7 10 47.11 4.70 12.57 13.85 0.25 5.01 9.49 2.97 0.78 0.58 97.31 Katla 8 7 47.06 4.70 12.35 13.83 0.24 4.87 9.51 2.94 0.79 0.56 96.85 Katla Sellandafjall 3 50.53 1.81 13.4 12.41 - 6.93 11.81 2.43 0.28 0.19 99.78 Veiðivötn (V~950) Sveigakot 5 49.67 1.77 13.4 12.40 - 6.86 11.62 2.22 0.23 0.23 98.39 Veiðivötn (V~950) 6 Journal of the North Atlantic No. 21 of tephra layer no. 6 is not easily determined; the data points are situated in the overlap between the Veiðivötn and the Grímsvötn data cluster (Fig. 5), but the high K2O compared to FeO and the low Feo/ TiO2 ratio (see Figure 2 in Óladóttir et al. 2011b) point to an origin in the Grímsvötn volcanic system. From the relative stratigraphic position (below H-1158) and chemical signature of the tephra layers and by comparison with the established regional tephrochronology (Einarsson et al. 1988, Sæmundsson 1991, Sigurgeirsson 2001, Thorarinsson 1951), it is clear that the Veiðivötn tephra layers at 283.5 (Tephra 4) and 271.5–272.0 cm (Tephra 3) in the core (Fig. 5, Table 2) represent the LTL and the 10th-century Veiðivötn tephra, respectively. The chemical composition of the 10th-century Veiðivötn layer (271.5–272.0 cm) in the core partly matches that of samples from the 10th-century Veiðivötn layer at the Sveigakot archaeological site and in a soil profile by Sellandafjall. The FeO/TiO2 ratio is slightly higher in the terrestrial sites than in the sediment core, but is still largely overlapping with it (Fig. 6). Only a few geochemical data of Tephra 3 are already published and available for comparison, which might explain the slight separation of the data clusters. The calculated sedimentation rate between LTL (A.D. 871 ± 2) and H-1158 (taking the approximate 0.5-mm thickness of the 10th-century Veiðivötn tephra into account) was 0.17 cm/year, or 5.74 years/cm. Applying this rate for estimating the age of the 10th-century Veiðivötn tephra gave A.D. 937 ± 6 (95% c.i.) (Tephra 3, see Tables 1, 3a). Based on the same sedimentation rate, the dates of Figure 5. A TiO2/FeO diagram of basaltic tephra layers from core SV-1 from Syðrivogar. Outlines of data clusters characteristic for three volcanic systems (Jakobsson 1979; Larsen 1982; Óladóttir et al. 2008, 2011a, 2011b) are also indicated. Tephra numbers are the same as in Table 1. Table 3. The age of the 10th-century Veiðivötn tephra, tephra 1, and tephra 5–8, calculated from sediment-accumulation rates based on two possible ages of the LTL: a) A.D. 871 (Grönvold et al. 1995) and b) A.D. 877 (Zielinski et al. 1997). The 95% confidence interval (c.i.) for the age of the 10th-century Veiðivötn tephra was calculated as t x S.E. (S.E. = sample standard deviation divided by SQRT(N-1)). Table t-value for P = 0.05 and df = 3 was 3.182. Years between Sedimentation rate Age (A.D.) Sediment core tephra layer (A.D.) (cm year-1) Tephra 1 V~950 Tephra 5 Tephra 6 Tephra 7 Tephra 8 a. Age calculation based on A.D. 871 ± 2 SV-1 1158–871 0.1736 1241 937.2 804.8 782.9 777.1 733.9 SAV-1/2 1300–871 0.2762 - 932.5 825.7 801.1 797.5 668.3 SAV-3/4 1300–871 0.2601 - 932.9 821.4 - - - SVA-9/10 1300–871 0.2755 - 929.4 818.4 802.8 - - Mean 933.0 817.6 795.6 787.3 701.1 95% c.i. ± 5.9 ± 16.6 - - - b. Age calculation based on A.D. 877 ± 4 SV-1 1158–877 0.1779 1239 941.9 812.1 790.7 785.1 742.8 SAV-1/2 1300–877 0.2801 - 937.7 832.4 808.1 804.5 677.1 SAV-3/4 1300–877 0.2638 - 938 827.4 - - - SVA-9/10 1300–877 0.2794 934.6 825.1 809.7 - - Mean 938.1 824.3 802.8 794.8 710.0 95 c.i. ± 5.5 ± 16.6 - - - 2013 M.Á. Sigurgeirsson, U. Hauptfleisch, A. Newton, and Á. Einarsson 7 3a, 4) should be considered as suggested rough ages. The stratigraphic positions of the LTL and the 10th-century Veiðivötn tephra in core SV-1 were verified in the sediment cores taken in 2011: SVA-2, SVA-3, SVA-8, and SVA-9 (Table 1, Fig. 7). Two additional well-known tephra layers, H-1300 and V-1477, were detected in these cores and identified by grain size and color. The age of the 10th-century Veiðivötn tephra was calculated based on the sedimentation rate between LTL (A.D. 871 ± 2) and H-1300 (Table 3a). Cores SVA-1 and SVA-2 yielded a sedimentation rate of 0.28 cm/year, resulting in an age of A.D. 933, and an identical age was calculated from the sedimentation rate of 0.26 cm/ year from cores SVA-3 and SVA-4. A slightly older age of A.D. 929 was calculated using the sedimentation rate of 0.28 cm/year obtained from SVA-9 and SVA-10. Using the younger age for the LTL (A.D. 877 ± 4) results in slightly increased sedimentation rates and dates for the 10th-century Veiðivötn, which are around 5 years younger (Table 3b). Combining the ages from the cores allows us to produce average age estimates for the 10th-century Veiðivötn tephra of A.D. 933 ± 6 (95% c.i.) using a LTL date of A.D. 871 or A.D. 938 ± 6 (95% c.i.) for a LTL date of A.D. 877 (Table 3). Figure 6. A TiO2/FeO diagram of tephra layer 3 (see Table 2) from core SV-1 from Syðrivogar, and previous analyses of the 10th-century Veiðivötn tephra from Sellandafjall (red filled circles) and the archaeological site of Sveigakot (red open circles) from Sigurgeirsson 2001. Outlines are the same as in Figure 5. Table 4. Origin and age of tephra layers in the sediment cores S V-1 and SVA-1, 2, 3, 4, 7, 8, 9, 10 from Syðrivogar , Lake Mývatn. Tephra layer Origin No. Name (Volcanic system) Year A.D. Reference 0a V-1477 Veiðivötn 1477 (Layer a) Thorarinsson 1958, 1976. 0b H-1300 Hekla 1300 Thorarinsson 1968. 1 Veiðivötn ca. 1241* This study. 2a Grímsvötn ca. 1167** Óladóttir et al. 2011a. 2b V-1159 Veiðivötn 1159 Larsen 1982. 2c H-1158 Hekla 1158 Thorarinsson 1968 , Larsen 2002. 3 V-Sv Veiðivötn 933 ± 6 *** (Formerly V~950) This study, Sigurgeirsson 2001. 4 V-871 (LTL) Veiðivötn 871 ± 2 and 877 ± 4 (The Landnam layer) Grönvold et al. 1995, Zielinski et al. 1997 . 5 Grímsvötn 817.6 ± 17 *** This study. 6 Grímsvötn 795.6 This study. 7 Katla 787.3 This study. 8 Katla 701.1 This study. *Calculation based on A.D. 871 ± 2 (Grönvold et al. 1995). **Calculation based on SAR from Sauðárhraukar (0.1154 cm yr-1; Óladóttir et al. 2011a). ***Mean, calculation based on A.D. 871 ± 2 (Grönvold et al. 1995). the other hitherto unknown tephra layers in core SV-1 became A.D. 1241 for Tephra 1, A.D. 805 for Tephra 5, A.D. 783 for Tephra 6, A.D. 777 for Tephra 7, and A.D. 734 for Tephra 8 (Table 3a). The 13th-century Veiðivötn tephra was only detected in core SV-1. Concerning the calculated dates of the tephra layers older than the LTL, it has to be taken into account that there is no precise chronological control below the LTL. Hence, these results (Tables 8 Journal of the North Atlantic No. 21 layers and seem older than it actually is). Densityinduced migration of tephra layers and spatial heterogeneity in the distribution of the tephra layers was not observed in the cores from Syðrivogar. The glass shards of the sampled tephra layers showed no signs of reworking, as proven by inspection under the stereomicroscope. The effect of bioturbation seems to be negligible in the cores from Syðrivogar, as the cores show no sign of bioturbation (Fig. 8). The geochemical results are pointing to tephra layers with homogeneous origin (Table 2). Only Tephra 2 is composed of three different tephra layers. The sample of Tephra 2b, right above H-1158 (Tephra 2c), contained 4 tephra shards with the geochemical signature of Veiðivötn and is interpreted as V-1159. Tephra 2a contained 5 tephra shards from the Grímsvötn volcanic system (Fig. 5, Table 2). The position of a Grímsvötn tephra above V-1159 in the sediment of Lake Mývatn is consistent with the results of Óladóttir et al. (2011a), who detected a Grímsvötn Discussion Despite the ideal conditions at Syðrivogar, there are problems associated with tephra stratigraphy in lacustrine sediments. These may arise from spatial heterogeneity of tephra fallout (Boygle 1999, Pyne-O’Donnell 2011), reworking of primary tephra (Boygle 1999, Gudmundsdóttir et al. 2011), and density-induced migration of tephra into the sediment (Anderson et al. 1984; Beierle and Bond 2002). Bioturbation of lake sediments by chironomids, fish, or waterfowl (Krantzberg 1985, McCall and Tevesz 1982, McLachlan and Cantrell 1976) can disperse a primary tephra layer in the sediment column. Of these, only density-induced migration of tephra is of concern in this study, and only if different tephra behave differently in this respect. If layer thickness is a crucial variable, the age of the relatively thick 10th-century Veiðivötn layer should be overestimated (i.e., it would sink further than the reference Figure 7. Soil sections with tephra layers from Sellandafjall (a), farm ruins (b), and midden (c) of the archaeological site of Sveigakot (a–c based on Sigurgeirsson 2001) compared to the stratigraphic position of sediment cores from Syðrivogar with correlated key tephra layers. Sediment cores: SV-1 (d), SVA-1, 2, 3, 4 (e), SVA-7, 8 (f), and SVA-9, 10 (g). Color code as in Figure 2; tephra layers of unknown volcanic origin are depicted in black. The scale on the left side is in cm below terrain edge and on the right side is in cm below the lake sediment sur face. Figure 8. Photograph of the lower half of sediment core SVA-3. Tephra layers V-Sv (3), LTL (4), and Grímsvötn (5) are marked. Tephra numbers are the same as in Table 1. 2013 M.Á. Sigurgeirsson, U. Hauptfleisch, A. Newton, and Á. Einarsson 9 the dating results of the 10th-century Veiðivötn tephra, presented in this paper. The correlation of Tephra layers 1 and 5–8 with existing tephrochronologies is uncertain. Tephra 1, originating from Veiðivötn and dated to ca. A.D 1241 could not be linked to existing marine and terrestrial tephrochronological records from Iceland. Tephra 7 (A.D. 787) and Tephra 8 (A.D. 701) originating from Katla should perhaps be compared to the Katla layers AT-4 (A.D. 815), AT-5 (A.D. 775), and AT-8-1 (A.D. 680) detected by Óladóttir et al. (2008) in soil sections of Atley, east of Mýrdalsjökull (Fig 1A). However, considering the suggested rough ages of tephra layers no. 5–8, all attempts to correlate the prehistoric layers to the established tephrochronological framework are at the present moment highly speculative. Thus, further tephrochronological research is needed to link the prehistoric tephra layers detected in Lake Mývatn to existing tephra records from outside the Mývatn area and the North Icelandic shelf. The name of a historical tephra layer is usually based on the originating volcanic system and the eruption date, often derived from historical records. The age estimation of the 10th-century Veiðivötn tephra is solely based on calculated sedimentation rates from lacustrine sediment cores, resulting not in a single date, but in a narrow time interval. Hence this paper proposes the name V-Sv (Sv for Sveigakot and Syðrivogar) for this tephra. The precise dating of individual layers of the Landnám tephra sequence, including the V-Sv tephra, will prove useful for archaeological work in the Mývatn area. The LTL was deposited right at the beginning of human settlement of this hitherto uninhabited island, and the V-Sv was produced shortly after the formal establishment of a state (the Commonwealth) according to historical sources. These two layers frame the settlement period and are therefore important for the interpretation of the environmental history of Iceland and the North Atlantic, and not least the palaeoecology of Lake Mývatn and surrounding lakes. This paper adds to the known eruption history of Iceland and improves the dating of the V-Sv tephra, but also acknowledges the necessity to discuss the reliability of the age calculation. Despite known problems associated with tephrochronological records derived from lake sediment archives (Anderson et al. 1984, Beierle and Bond 2002, Boygle 1999, Pyne-O’Donnell 2011), lakes can provide stable-enough environments for reliable tephra stratigraphies. Tephrochronological work based on lake sediment cores truly demands a high technical effort, but particularly in areas with poor or disturbed soil records, lacustrine cores provide a valuable alternative to soil sections. tephra layer right on top of H-1158 in soil sections at Sauðárhraukar, Kárahnjúkar, and Snæfell (Fig.1A). Another potential source of bias is the assumption that the sedimentation rate was stable over the period ca. A.D. 730–1160. Dugmore and Buckland (1991) observed in soil sections in South Iceland an increase of sediment accumulation immediately after deposition of the LTL, which then declined within a couple of centuries. Assuming a similar change in sediment accumulation in Lake Mývatn, it would tend to make the tephra seem younger than it is. However, full-scale soil erosion associated with human activities started very late in the Mývatn area, or in the 17th century (Einarsson et al. 1988). Nevertheless one should expect some erosion to start soon after the settlement around A.D. 870, leading to slightly increasing sedimentation rates towards the reference tephras of H-1158 and H-1300. Lawson et al. (2007) found evidence of a pulse of nutrient enrichment in Lake Helluvaðstjörn on the west side of Mývatn soon after the Norse settlement, which can probably be ascribed to nutrient mobilization by grazing or woodland clearance, with actual soil reworking starting later (ca. A.D. 1200). Any increase in sedimentation rate due to erosion or enrichment at this time would lead to an overestimate of the date of the 10th-century Veiðivötn tephra (i.e., it would seem older than it is). The results showed a nearly uniform sedimentation rate between 0.19–0.28 cm/year calculated for the time interval between the LTL (A.D. 871 ± 2) and H-1300. The age of the 10th-century Veiðivötn tephra could be narrowed down to a time interval of A.D. 929–A.D. 937, with a mean of 933, but as any bias would tend to make it seem earlier than it is, A.D. 940 may be a more realistic date. The 10th-century Veiðivötn tephra can be correlated to a Veiðivötn tephra layer of comparable age, detected in a few soil sections in North Iceland and a marine sediment core from the North Icelandic shelf region. Larsen (1982) describes in soil sections of Jökuldalur, northeastern Iceland (Fig. 1A) a Veiðivötn tephra dated by soil-accumulation rates to A.D. 940. Lawson et al. (2007) identified the 10th-century Veiðivötn layer in a lake sediment core from Helluvaðstjörn, 6 km SW of Lake Mývatn (Fig. 1B). The tephra was also traced in nearby soil sections, but the authors reported disturbance of the tephra profiles by erosion (Lawson et al. 2007). Gudmundsdóttir et al. (2012) detected in marine core MD99-2275 (Fig. 1A) a Veiðivötn tephra layer positioned between H-1104 and K~920 and dated by a tephrochronological age model to A.D. 955. Furthermore, a Veiðivötn layer was detected between H-1104 and the LTL in the soil section of Svartárkot and Sauðárhraukar (Fig. 1A; Gudmundsdóttir et al. 2012). The results of Larsen (1982), Lawson et al. (2007), and Gudmundsdóttir et al. (2012) strengthen 10 Journal of the North Atlantic No. 21 Gudmundsdóttir, E.R., J. Eiríksson, and G. Larsen. 2011. Identification and definition of primary and reworked tephra in Late Glacial and Holocene marine shelf sediments off North Iceland. Journal of Quaternary Science 26:589–602. Gudmundsdóttir, E.R., G. Larsen, and J. Eiríksson. 2012. Tephra stratigraphy on the North Icelandic shelf: Extending tephrochronology into marine sediments off North Iceland. Boreas. Available online at DOI 10.1111/j.1502-3885.2012.00258.x. Hallsdóttir, M. 1987. Pollen analytical studies of human influence on vegetation in relation to the landnám tephra in southwest Iceland. Lundqua Thesis 18:1–45. Lund, Sweden. 45 pp. Hjartarson, Á. 1989. Halastjörnur, sólmyrkvar, eldgos og áreiðanleiki annála. [In Icelandic]. (Comets, solar eclipses, volcanic eruptions, and the reliabililty of the annals). Árbók Hins íslenzka fornleifafélags (Yearbook of the Icelandic Archaeological Society). 86:85–100. Jakobsson, S.P. 1979. Petrology of recent basalts of the Eastern Volcanic Zone, Iceland. Acta Naturalia Islandica 26:1–103. Jakobsson, S.P., K. Jónasson, and I.A. Sigurdsson. 2008. The three igneous rock series of Iceland. Jökull 58:117–138. Jóhannesson, H., and S. Einarsson. 1988. Krísuvíkureldar I. Aldur Ögmundarhrauns og miðaldalagsins. [In Icelandic with English summary]. (The Krísuvík fires I. The age of the Ögmundarhraun lava flow and the medieval tephra layer). Jökull 38:71–85. Jowsey, P.C. 1966. An improved peat sampler. New Phytologist 65:245–248. Krantzberg, G. 1985. The influence of bioturbation on physical, chemical and biological parameters in aquatic environments: A review. Environmental Pollution (Series A) 39:99–122. Larsen, G. 1982. Gjóskulagatímatal Jökuldals og nágrennis. [In Icelandic]. (Tephrochronology of Jökuldalur and the surrounding areas). Pp. 51–65, In H. Thórarinsdóttir, Ó.H. Óskarsson, S. Steinthórsson, and Th. Einarsson (Eds.). Eldur er í norðri. [In Icelandic]. (Fire is in the North). Sögufélag, Reykjavík, Iceland. 462 pp. Larsen, G. 1984. Recent volcanic history of the Veidivötn fissure swarm, southern Iceland: An approach to volcanic risk assessment. Journal of Volcanology and Geothermal Research 22:33–58. Larsen, G. 2002. A brief overview of eruptions from ice-covered and ice-capped volcanic systems in Iceland during the past 11 centuries: Frequency, periodicity, and implications. Pp. 81–90, In J.L. Smellie and M.G. Chapman (Eds.). Volcano-Ice Interactions on Earth and Mars. Geological Society of London. Special Publication 202. London, UK. 348 pp. Larsen, G., A.J. Dugmore, and A.J. Newton. 1999. Geochemistry of historical-age silicic tephras in Iceland. The Holocene 9:463–471. Larsen, G., J. Eiríksson, K.L. Knudsen, and J. Heinemeier. 2002. Correlation of late Holocene terrestrial and marine tephra markers in North Iceland. Implications for reservoir age changes and linking land-sea chronologies in the northern North Atlantic. Polar Research 21:283–290. Acknowledgments We thank Johanna Jacobi and Antoine Millet for assistance with sediment coring, Garðar Guðmundsson with core sampling in the laboratory, and Guðrún Larsen for useful information and discussions. Electron microprobe analyses were carried out at the Tephra Analytical Unit, School of GeoSciences, University of Edinburgh with the kind assistance of Dr. Chris Hayward. Finally, we would like to thank two anonymous reviewers who provided valuable comments and suggestions on a first version of this paper. Literature Cited Anderson, R.Y., E.B. Nuhfer, and W.E. Dean. 1984. Sinking of volcanic ash in uncompacted sediment in Williams Lake, Washington. Science 225:505–508. Beierle, B., and J. Bond. 2002. Density-induced settling of tephra through organic lake sediments. Journal of Paleolimnology 28:433–440. Benediktsson, J. (Ed.). 1968. Íslendingabók. Landnámabók. [In Icelandic]. (The Book of Icelanders. The Settlement Book). Íslenzk fornrit I. Hið íslenzka fornritafélag, Reykjavík, Iceland. 139 pp. Boygle, J. 1999. Variability of tephra in lake and catchment sediments, Svínavatn, Iceland. Global and Planetary Change 21:129–149. Dugmore, A.J., and P.C. Buckland. 1991. Tephrochronology and late Holocene soil erosion in south Iceland. Pp. 147–159, In J.M. Maizels and C. Caseldine (Eds.). Environmental Change in Iceland, Past and Present. Kluwer Academic Publishers, Dordrecht, The Netherlands. 332 pp. Einarsson, Á., H. Hafliðason, and H. Óskarsson. 1988. Mývatn: Saga lífríkis og gjóskutímatal í Syðriflóa. [In Icelandic with English summary]. (Lake Mývatn: Palaeolimnology and tephrochronology of the Sydriflói Basin). Mývatn Research Station, Report no. 4. Náttúruverndarráð, Reykjavík, Iceland. 96 pp. Einarsson Á., H. Óskarsson, and H. Haflidason. 1993. Stratigraphy of fossil pigments and Cladophora and its relationship with tephra deposition in Lake Mývatn. Journal of Paleolimnology 8:15–26. Einarsson Á., G. Stefánsdóttir, H. Jóhannesson, J.S. Ólafsson, G.M. Gíslason, I. Wakana, G. Gudbergsson, and A. Gardarsson. 2004. The ecology of Lake Myvatn and the River Laxá: Variation in space and time. Aquatic Ecology 38:317–348. Einarsson, Th. 1961. Pollenanalytische Untersuchungen zur spät- und postglazialen Klimageschichte Islands. In German. (Pollenanalytical research concerning the late- and postglacial climate history of Iceland). Sonderveröffentlichungen des Geologischen Institutes der Universität Köln. 6, Cologne, Germany. 52 pp. Eldjárn, K., and A. Fridriksson. 2000. Kuml og haugfé úr heiðnum sið á Íslandi. In Icelandic. (Graves and Grave Finds in Pagan Iceland). Mál og menning, Reykjavík, Iceland. 615 pp. Grönvold, K., N. Óskarsson, S.J. Johnsen, H.B. Clausen, C.U. Hammer, G. Bond, and E. Bard. 1995. Ash layers from Iceland in the Greenland GRIP ice core correlated with oceanic and land-based sediments. Earth and Planetary Science Letters 135:149–155. 2013 M.Á. Sigurgeirsson, U. Hauptfleisch, A. Newton, and Á. Einarsson 11 Sigurgeirsson, M.Á., O. Vésteinsson, and H. Hafliðason. 2002. Gjóskulagarannsóknir við Mývatn–aldursgreining elstu byggðar. [In Icelandic with English summary]. (Tephrochronological investigation at Lake Mývatn–establishing the age of the oldest settlements) Pp. 107–109, In O. Vésteinsson (Ed.) Archaeological investigations at Sveigakot 2001. Progress report FS173-00212. Fornleifastofnun Íslands (The Icelandic Institute of Archaeology), Reykjavík, Iceland. 118 pp. Storm, G. (Ed.). 1888. Islandske Annaler indtil 1578. [ In Danish]. (Icelandic Annals until 1578). Gröndal and Söns Bogtrykkeri, Christiania (Oslo), Norway. 667 pp. Stuiver, M., P.J. Reimer, E. Bard, J.W. Beck, G.S. Burr, K.A. Hughen, B. Kromer, G. McCormac, J. van der Plicht, and M. Spurk. 1998. INTCAL98 Radiocarbon Age Calibration, 24000-0 cal BP Radiocarbon 40:1041–1083. Thorarinsson, S. 1944 Tefrokronologiska studier på Island. Þjórsárdalur och dess förödelse. [In Swedish]. (Tephrochronological studies in Iceland. The Þjórsárdalur valley and the destruction of its settlement). Geografiska Annaler 1–2:1–217. Thorarinsson, S. 1951. Laxárgljúfur and Laxárhraun: A tephrochronological study. Geografiska Annaler 33:1–89. Thorarinsson, S. 1958 The Öræfajökull eruption of 1362. Acta Naturalia Islandica II (2). 100 pp. Thorarinsson, S. 1968. Heklueldar. [In Icelandic]. (Eruptions in Hekla). Sögufélag, Reykjavík, Iceland. 185 pp. Thorarinsson, S. 1976. Þáttur af Þegjandadal. [In Icelandic]. (A story from Þegjandadalur). Pp. 461–470, In G. Kolbeinsson (Ed.). Minjar og menntir. [In Icelandic] (Antiquities and Knowledge). Bókaútgáfa Menningarsjóðs, Reykjavík, Iceland. 576 pp. Thorarinsson, S. 1979. The postglacial history of the Mývatn area. Oikos 32:17–28. Vésteinsson, O. (Ed.). 2001. Archaeological investigation at Sveigakot 1998–2000. Pp. 4–12, In O. Vésteinsson (Ed.) Archaeological investigations at Sveigakot 1998–2000. Progress report FS134-00211. Fornleifastofnun Íslands, Reykjavík, Iceland. 72 pp. Vésteinsson, O. 2003. Archaeological investigation at Sveigakot 2002. Progress report FS206-00213. Fornleifastofnun Íslands, Reykjavík, Iceland. 83 pp. Wastegaard, S., S. Björck, M. Grauert, and G.E. Hannon. 2001. The Mjáuvøtn tephra and other Holocene tephra horizons from the Faroe Islands: A link between the Icelandic source region, the Nordic Seas, and the European continent. The Holocene 11:101–109. Zielinski G.A., P.A. Mayewski, L.D. Meeker, K. Grönvold, M.S. Germani, S. Whitlow, M.S. Twickler, and K. Taylor. 1997. Volcanic aerosol records and tephrochronology of the Summit, Greenland, ice cores. Journal of Geophysical Research 102:26, 625–626, 640. Lawson, I.T., F.J. Gathorne-Hardy, M.J. Church, A.J. Newton, K. J. Edwards, A.J. Dugmore, and Á. Einarsson. 2007. Environmental impacts of the Norse settlement: Palaeoenvironmental data from Mývatnssveit, northern Iceland. Boreas 36:1–19. McCall, P.L., and M.J.S. Tevesz. 1982. The effects of benthos on physical properties of freshwater sediments. Pp. 105–176, In P.L. McCall and M.J.S. Tevesz (Eds. ): Animal-Sediment Relations. The Biogenic Alteration of Sediments. Plenum Press, New York, NY, USA. 336 pp. McGovern, T.H., Ó. Vésteinsson, A. Fridriksson, M. Church, I. Lawson, I.A. Simpson, Á. Einarsson, A. Dugmore, G. Cook, S. Perdikaris, K.J. Edwards, A.M. Thomson, W.P. Adderley, A. Newton, G. Lucas, R. Edvardsson, O. Aldred, and E. Dunbar. 2007. Landscapes of settlement in northern Iceland: Historical ecology of human impact and climate fluctuation on the millennial scale. American Anthropologist 109:27–51. McLachlan, A.J., and M.A. Cantrell. 1976. Sediment development and its influence on the distribution and tube structure of Chironomus plumosus L. (Chironomidae, Diptera) in a new impoundment. Freshwater Biology 6:437–443. Nielsen, C.H., and H. Sigurdsson. 1981. Quantitative methods for the electron microprobe analysis of sodium in natural and synthetic glasses. American Mineralogist 66:547–52. Óladóttir, B.A., O. Sigmarsson, G. Larsen, and Th. Thordarson. 2008. Katla volcano, Iceland: Magma composition, dynamics, and eruption frequency as recorded by Holocene tephra layers. Bulletin of Volcanology 70:475–493. Óladóttir, B.A., G. Larsen, and O. Sigmarsson. 2011a. Holocene volcanic activity at Grímsvötn, Bárdarbunga, and Kverkfjöll subglacial centres beneath Vatnajökull, Iceland. Bulletin of Volcanology 73:1187–1208. Óladóttir, B.A., O. Sigmarsson, G. Larsen, and J.L. Devidal. 2011b. Provenance of basaltic tephra from Vatnajökull subglacial volcanoes, Iceland, as determined by major- and trace-element analyses. The Holocene 21:1037–1048. Ólafsdóttir, R., and H.J. Guðmundsson. 2002. Holocene land degradation and climatic change in northeastern Iceland. The Holocene 12:159–167. Pilcher, J., R.S. Bradley, P. Francus, and L. Anderson. 2005. A Holocene tephra record from the Lofoten Islands, Arctic Norway. Boreas 34:136–156. Pyne-O’Donnell, S. 2011. The taphonomy of Last Glacial- Interglacial Transition (LGIT) distal volcanic ash in small Scottish lakes. Boreas 40:131–145. Sæmundsson, K. 1991. Jarðfræði Kröflukerfisins. [In Icelandic]. (Geology of the Krafla volcanic system). Pp. 25–95, In A. Gardarsson and Á. Einarsson (Eds.). Náttúra Mývatns. [In Icelandic]. (The Natural History of Lake Mývatn). Hið íslenska náttúrufræðifélag (The Icelandic Society of Natural Science), Reykjavík, Iceland. 372 pp. Sigurgeirsson, M.Á. 2001. Greinargerð um gjóskulög. [In Icelandic with English summary]. (Tephrochronological research). Pp. 39–42, In O. Vésteinsson (Ed.) Archaeological Investigations at Sveigakot 1998–2000. Progress report FS134-00211 Fornleifastofnun Íslands (The Icelandic Institute of Archaeology), Reykjavík, Iceland. 72 pp.